Winter is a great time to visit royals in the US — bald eagles, that is. The magnificent birds abound year around in Alaska, and they breed also in many parts of the Lower 48 States. But in winter thousands more bald eagles come south, to rivers, coasts, lakes, and estuaries. In winter, you can find bald eagles in every US state except Hawaii. Although they usually stay around water, you can also find them in rangelands and farmland, where they will gather to feed on the carcasses of animals that are winter killed. It's not the sting of Arctic air that drives the eagles south. The big birds don't care about the cold. What they're after is food. Especially fish, one of the mainstays of a bald eagle's diet. Rivers are full of fish even in winter, but a frozen river locks the fish away from the hungry eagles. A patch of river that is free from ice, however, is buffet dining for bald eagles. That is why thousands of bald eagles winter along the Mississippi River. The turbulence of water coming through the locks and over the dams keeps the surface of the water from freezing. And to make it even easier for the eagles, the fish get stunned when they tumble over a dam. Above the river, bald eagles soar, watching for floating fish. Easy prey. The colder the winter, the better your chances of seeing eagles, because if the river is open only at the dams, the eagles will there. Just as eagles flock to the dams for fish, people flock there to see the eagles. "Bald Eagle Days" celebrations have become big attractions in lock-and-dam cities on the Mississippi: Bellevue, Clinton, Keokuk, Le Clair, and the Quad Cities. Most of the Bald Eagle Days are in January. However, you can see eagles any time in winter, as long as the river is frozen and there is open water below a dam. Once the ice melts, the eagles will disperse, because they will no longer be tied to isolated patches of open water. Adult bald eagles are unmistakable. With a seven foot wing span, they look huge in flight. Their brilliant white heads and white tails contrast with their black wings and bodies. 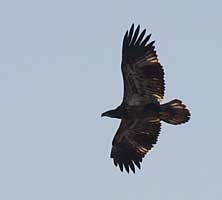 You'll also see other eagles that are equally large but with dark heads and tails: those are the immature birds. They won't develop their adult plumage, with characteristic white head and tail, until age 4 or 5. If you don't immediately see any eagles, study the tops of the tallest trees on both sides of the river. Soon you'll become aware of a white spot, the snowy head of a motionless eagle. And then another. Perhaps a child you've brought with you will suddenly shout, "Look, up there! And over there! There are tons of them!" And then your eyes will start to pick them out, scores of eagles, or even hundreds. By all means, take binoculars when you go. Any kind of telescope or spotting scope will also be helpful. Bald eagles used to nest throughout the US. But most of the early reports are telling about eagles being shot, or their nests being robbed by egg collectors. To make things even worse, the insecticide DDT began to pollute the food chain in the late 1940s. DDT was sprayed on crops, and it washed into rivers. Fish ate the DDT and concentrated it in their bodies. Eagles ate the fish, further concentrating the poison, and it wreaked havoc on their nesting. It caused their eggshells to become so thin that they broke before the chicks could develop. It began to look as if the symbol of our nation might disappear entirely from the lower 48 states. Were we going we have to choose a new national bird? Fortunately, as the eagles declined, public concern rose, and Americans enacted laws to save them. The Bald Eagle Protection Act of 1940 made it illegal to possess, kill, or disturb an eagle or its nest, except under special circumstances and with a special permit. It is against federal law to possess even a single feather from an eagle. But the most important step in bringing back the eagle was banning DDT, in 1972. Since then, the bald eagle has bounced back. In many states, bald eagle nests are growing more numerous every year. And it's not rare any longer for a birdwatcher to see a bald eagle in winter. Michael and I go at least once each winter to the Mississippi River to see the eagles. It's a kind of pilgrimage. That's how I found myself standing near the lock at Keokuk, Iowa, one December afternoon, watching a dozen eagles perched in a tree across the river. I also saw a huge dark bird hanging in the sky. It's body was black. Its head and tail were white. It held its wings as straight and flat as boards. Without flapping, it moved in slow circles above the river. After a minute it seemed to grow larger, and I realized it was coming down. There is an impression of purpose in the eagle's deliberate glide. With great dignity, the eagle made a big shallow arc, like a swinging pendulum, calculated to touch the surface of the water at a single point. That point was a fish, stunned from going over the dam, and now floating passively in the current. Approaching the water, the eagle lowered its long legs like the landing gear of an airplane. I could see that its feet were bare, and that the feathers came only part way down its legs. Just before the bottom of its arc, the eagle reached far forward with its feet and then thrust them back and downward toward the surface. Only the talons touched the river, as the fish was plucked neatly from the water. The eagle never got a feather wet. Now the powerful wings were pumping, the legs trailing. Fast in the talons of one foot, the stunned fish rose into the air without ever realizing that it was about to be transformed into eagle. The wind was icy off the river, and my hands were growing very cold. Text copyright 2007 by Diane Porter. If your state is not represented here, or if you know a better site than the one I have listed here, please let me know.